Despite non-profit organizations are beyond the market, they are not exempted from pursuing their best performance, because they are using limited and scarce public resources and additionally, face an increasing opportunity cost. In this sense, the analysis of non-profit organizations behaviour in terms of technical and allocative efficiency is more than justifiable. First of all, we should refresh both concepts of efficiency. A firm is technically efficient when it produces a certain level of output using the minimum quantity of inputs (or produces the maximum quantity of output given a certain quantity of inputs). And it is allocatively efficient when it uses inputs in optimal proportions, given their respective market prices, the production technology and the desired level of output. The Princess of Asturias Foundation (Fundación Princesa de Asturias) is a private Spanish non-profit institution, created in 1980, whose essential aims are to contribute to extolling and promoting those scientific, cultural and humanistic values that form part of the universal heritage of humanity and consolidate the existing links between the Principality of Asturias, a region in the north of Spain, and the Crown of Spain. Throughout its 35 years of life, the Foundation has used different instruments to achieve these goals. The most powerful and relevant are the Prince (Princess since 2014) of Asturias Awards, conferred yearly and aimed at rewarding the scientific, technical, cultural, social and humanistic work performed by individuals, institutions, or groups of individuals or institutions in any part of the world, especially in the Ibero-American countries. These Awards comprise eight categories: The Arts, Literature, Social Sciences, Communication and Humanities, Technical and Scientific Research, International Cooperation, Concord and Sports. And, frequently, the prizes are awarded to well-known and recognized international people, such as Francis Ford Coppola, Paul Krugman or Peter Higgs among others. The Foundation also contributes to the promotion of musical activities in Asturias, both in terms of musical concerts and events as well as developing music education programs. And, finally, the Foundation has fostered many other activities orientated towards promoting the cultural environment and abilities in Asturias. In 2012 its income totalled €5.72 million; 63% of the latter coming from private donors, 19% from own assets and 18% from public grants. We use an input distance function in order to analyse the Foundation performance in terms of technical and allocative efficiency. This procedure has some advantages in contrast to the more popular production function and cost function. First, it is especially suitable in the presence of multi-output production. Second, it does not imply cost minimization, that it is particularly relevant in the case of non-market oriented institutions. And third, it allows the obtainment of a measure of allocative inefficiency which is direct and independent of the degree of technical inefficiency. Since the Foundation is a unique institution, we have constructed the optimal frontier function using the institution’s own history as the source of information. We have collected all the relevant economic information from the Foundation for the period 1988-2012, which allows us to identify the most successful years of activity as well as detect possible areas for change and improvement. The Foundation produces what can be considered to be a multiple output in line with its aims to promote scientific, cultural and humanistic values. Because of this, we have considered three activities or outputs, namely the Prince of Asturias Awards (PPA), Musical Activities (AM) and Other Activities (OAC). How to actually measure these outputs proves to be a real challenge due to their very nature. Because of its non-market nature, we cannot use usual measures such as number of visitors or attendants, total revenues, number of events or performances. Instead here, we have used the amount of budget expenditure allocated to each of the three aforementioned activities for every year of the time period being studied. We have considered three inputs: labour (L), current assets (K) and other expenditures (OG). Labour is the number of employees. Current assets have been measured using depreciation expense excluding building depreciation. Other expenditures incorporate those expenditures not included in current assets depreciation or labour expenses, and in particular the expenditure incurred on outsourced activities. During the entire period being considered, the Foundation shows a reasonably good performance. 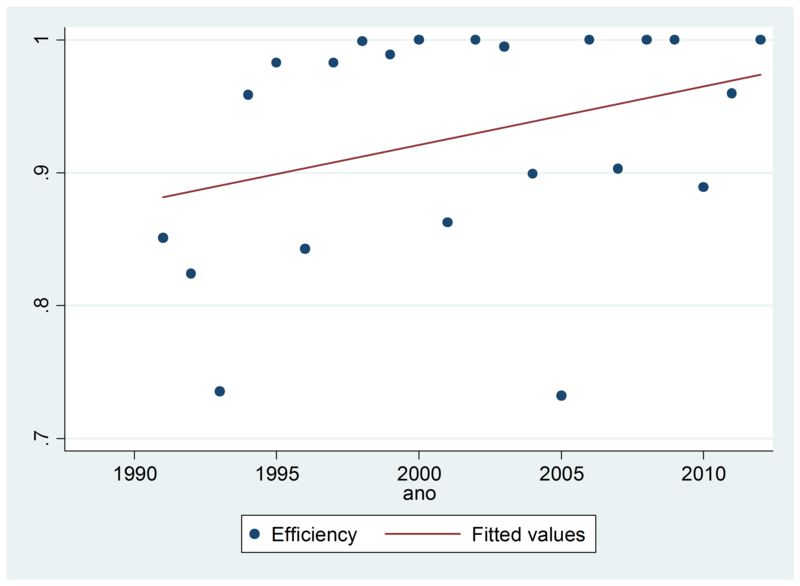 On average, its technical efficiency index is 93%. Furthermore, it has experienced a “learning by doing” effect that has led to a progressive improvement during the period analysed (Figure 1). We also observed that the Foundation has over utilized the outsourced tasks, although it has improved the mixture of labour, capital and outsourced inputs in a process which has eventually converged in an optimal combination. Workers are deeply committed to the aims of the Foundation, particularly in the presence of special situations and events. Based on this fact, we consider that a case may exist for designing an additional and not necessarily monetary incentive scheme to reinforce their link to the Foundation, something which could be applicable to non-profit institutions in general. Víctor Fernández-Blanco is Senior Lecturer, PhD, at the University of Oviedo, Department of Economics. Ana Rodríguez-Álvarez is Senior Lecturer, PhD, at the University of Oviedo, Department of Economics and member of the Oviedo Efficiency Group.